If there is such a thing as “The Vegas of the Caribbean,” (and believe it or not, more than one island is referred to in this way!) then the Bahamas would most certainly earn the title. Unless you’ve beached yourself on one of the remote outer islands, you’re almost certainly going to come across the opportunity to play a hand, roll the dice or pull the lever at one of several gambling establishments during your Bahamas vacation. The four largest and glitziest casinos are Atlantis (on Paradise Island), Crystal Palace Casino (New Providence Island), The Crowne Plaza Golf Resort & Royal Oasis Casino and Our Lucaya (both on Grand Bahama Island). There are also countless other spots to try your luck in hotels across the islands, so even if you don’t consider yourself a gambler, you may just find temped to earn a little extra spending money at one of the tables or slot machines during your getaway.Our advice: Get prepped for the inevitable (“oh, okay, I’ll just play one hand/round/dollar”) before you open your wallet.And before you throw down your hard-earned cash in a live casino, click here to play online and get some practice first! Gambling, especially for first time casino-goers, can be a huge rush. 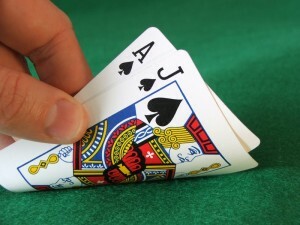 Picture it: You’re sitting at the blackjack table and before you know it, your pile of chips is getting bigger and bigger (if luck is on your side, of course). At that point, it’s a good idea to create a separate stack of chips that represents your original investment, and another one for your winnings. Once you’re up, try only to gamble out of your winnings and not out of the original stack of chips you paid for. That way if you “lose,” you can still cash in and come out even. Know when to stop. Only go into the casino with a set amount of cash, and ditch your credit or debit cards at your hotel room. If you lose your money, it’s okay. Approach it like a game or a night’s entertainment. And don’t overdraft your bank account because you have your heart set on winning it all back. Instead, think about how much money you’d spend at a night club or going out for dinner and a movie, and approach the casino like that. On a big night out, you could drop anywhere from 1oo to 200 bucks, so don’t sweat it too much. But know when to call it a night, and only gamble what you can afford to lose. Like any night out, it’s smart to play the buddy system for safety reasons. Casinos are no different. You probably wouldn’t go to a nightclub alone, so don’t hit the casinos alone either. $$ Saver Hint: lay off the booze when you’re throwing around money… you’ll take more financial risks and be less smart if you’re tipsy.